The Site title (blog name) and/or the optional Tagline can be changed on the top of this page at any time. > Settings > General … “save changes”. That is exactly where search engine spiders look for the site title and removing it from there can cause issues with getting your content indexed. Note that the site title (blog name) and blog address URL do not have to be the same but it’s better for SEO (search engine optimization) if they are the same. 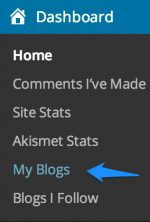 We cannot edit any blog URLs. If you want to change the .wordpress.com blog address ie. the URL starting with http:// then you must be logged in as Admin under the exact same username account that registered the blog to do that and the URL you desire must be available. If so, then you can change the URL by using the guide http://en.support.wordpress.com/changing-blog-address/ Then all the content will be the same only the URLs will change and nothing else. You can only purchase one year at a time. Every upgrade applies to a single blog only and is a one year subscription that requires renewal at years’ end. All that changes when you are domain mapping is the URL and nothing else. The content stays exactly where it is. What domain mapping does its create a seamless transfer between the underlying .wordpress.com blog URLs to the domain URLs no matter where they are on the internet. Visitors who click the underlying .wordpress.com blog URLs will be seamlessly redirected to the exact same content under the domain URLs. You can simply publish a post providing the new URL to your existing subscribers and ask them to subscribe to the new URL. In order to map to a domain one must have an underlying .wordpress.com sub-domain blog to map from, and the domain name you desire must be available for purchase, or you must already own the domain URL. After you do the primary blog set up it can take between 24 – 72 hours for domain name propagation to take place throughout the internet. You can view the DNS changes here > http://www.whatsmydns.net/ What’s important during that stage is to be patient. The topic ‘Primary Site name’ is closed to new replies.